Post written by Brian Foster, aka Bug. Follow him on Twitter. DeAndre Ayton: From a physical standpoint, DeAndre Ayton is the most NBA-ready of all the bigs projected in the top half of the lottery. 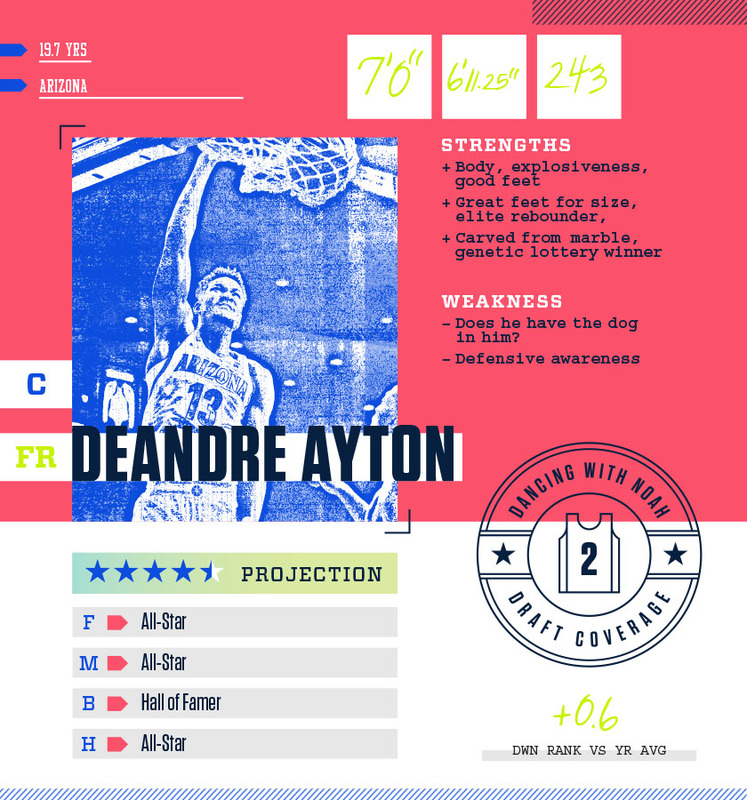 Standing at a rock solid 7’1”, 250 pounds, Ayton has the physique and mobility of a young David Robinson. Although Ayton doesn’t possess the shot-blocking acumen of the Admiral, he is the perfect blend of throwback size/strength with some modern NBA big floor skills sprinkled in. What stands out the most when I watch Ayton is his footwork and agility for a man that big. That rare ability to have that size/athleticism combination along with his elite footwork is what sets him apart from the other elite bigs in this draft. Ayton has a good balance to his offensive game that allows him to score in a variety of ways. His physical gifts make him a great finisher around the rim on both post-ups and pick-and-roll dives to the rim. At Arizona, he played with another center on the floor, while also facing a lot of zone defenses, so I expect him to be even more of a beast on the block with more room to operate. Ayton exhibits an excellent touch on his jump shot from the mid-range, so he has the potential to be a pick-and-pop threat if he develops range to the three-point line. His 73% free throw shooting is a good sign for his jump shot translating to the pros. Another area Ayton excels at offensively is efficiency. He had a PER of 32.6 during his freshman season, averaging 20.1ppg on only 13 shot attempts. Paired with his elite rebounding stats (11.6rpg), Ayton was an absolute monster for teams to handle from the moment he stepped on the court. Like most young prospects, Ayton has areas of concern that he will have to improve upon to reach his full potential. The concerns with Ayton come on the defensive end of the floor. His defensive struggles seem to be more focus and recognition problems. At times, he will kind of space off and lose his man or allow his guy to get to the rim without much contest. He also had a low steal average at 0.6/game with just under two blocks. You would think he has the ability to double both of those averages with the minutes he had on the floor. He averaged a low 2.3 fouls-per-game while also playing a whopping 33.5 minutes each night, so it is fair to wonder if some of the low work rate on defense was from fatigue. I’m not as concerned as some may be about his defensive struggles, mostly because someone with that much athletic ability can become, at worst, a capable defender with experience and coaching. Ayton has the potential to be an all-time great if he can clean up some of those defensive lapses, while also showing some more nasty when protecting the paint. Assuming no health issues arise down the road, my money is on Ayton reaching his potential, becoming a dominant force for years to come with Hall of Fame-type numbers when it is all said and done. 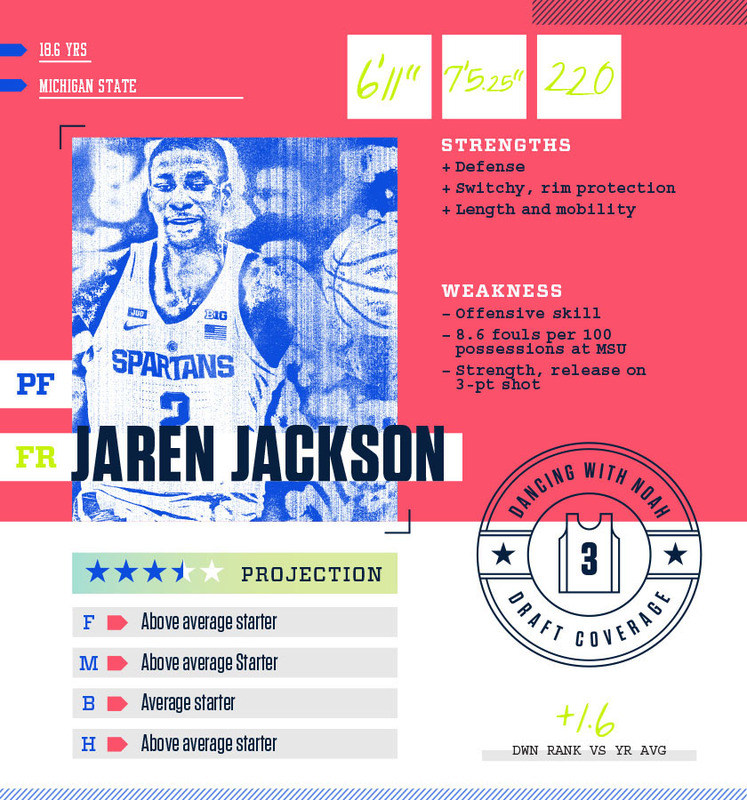 Jaren Jackson: Jaren Jackson Jr. is one of the most intriguing players in the draft, possessing traits NBA execs are looking for from a high lottery pick. Jackson is young (doesn’t turn 19 until September), oozing with upside, and passed the NBA combine measurement tests with flying colors. During his freshman season at Michigan State, he showed the ability to provide elite rim protection, while also being able to switch and contain guards if needed. Jackson used his long 7’5” wingspan to block three shots-per-game while only playing 22 minutes en route to Big Ten DPOY honors. In this modern era of switching defenses, that defensive versatility and rim protection alone should get Jackson minutes right away. As an added bonus, Jackson also proved to be a capable outside shooter while in East Lansing, shooting a very respectable 39% from deep on 2.7 attempts per game. It remains to be seen if that percentage will translate to the NBA three-point line, but even having a pick and pop game in the 15-18 foot range is going to be a plus at his size. The two biggest red flags for me with Jackson are his playing time and production in college. Some of the playing time issues were his own doing with foul trouble (8.6 fouls per 100 possessions), but Michigan State’s roster wasn’t talented enough for him to only be playing half of the game. Jackson also leaves a lot to be desired as a rebounder. He started out the season strong with five double-doubles in his first 10 games, but only had one double-digit rebounding game in his last 25 games of the season. With his size and length, you would hope to see a much better rebound rate, especially considering Coach Tom Izzo’s reputation for his teams always crashing the glass hard. All things considered, Jackson is still an 18-year-old kid learning to play the game. The difference between Jackson and the other bigs at the top of the draft, is that I believe Jackson is still a couple of years away from being a starting caliber player. If the team selecting him in the draft is expecting to get a player they need to produce right away, I think they’ll be disappointed. Patience will be the key for whoever selects Jackson.